Tolkien, Race and Cultural History explores the evolution of Tolkien’s mythology by examining how it changed as a result of Tolkien’s life story and contemporary cultural and intellectual history. The book considers Tolkien’s creative writing as an ever-developing ‘legendarium’: an interconnected web of stories, poems and essays, from his early poems in the 1910s to his latest writings in the early 1970s. Consequently, the book is not restricted to a discussion of Tolkien’s best-known works only (The Hobbit, The Lord of the Rings and The Silmarillion) but examines the whole corpus of his legendarium, including the 12-volume History of Middle-earth series, which has received little attention from critics. This new approach and scope brings to light neglected aspects of Tolkien’s imaginative vision and addresses key features of Tolkien’s creativity: the centrality of the Elves and the role of linguistic invention in his legendarium, as well as race and material culture in Middle-earth. 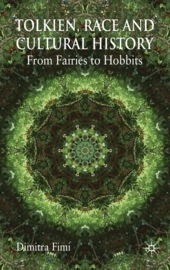 Dimitra Fimi’s Tolkien, Race and Cultural History: From Fairies to Hobbits is a clear, thorough, well-argued study of what has been a key lacuna in Tolkien studies. It will be especially welcome to students and general admirers of Tolkien’s writings, to whom most of the background material will be unfamiliar. For even the most experienced Tolkien scholars, the book stands as a model of how scholarly studies of Tolkien should be approached and carried out. In addition, Fimi’s research opens the door to new questions and deeper inquiries… The strength of Fimi’s thesis and her skill in marshalling the evidence to support it — traversing the entire legendarium and its many satellite writings to do so — has earned her the 2010 Mythopoeic Scholarship Award for Inklings Studies. The same care and skill should justly earn her a place on the bookshelves of scholars and fans alike. Fimi’s book is one of the most interesting and original analyses of Tolkien’s subcreation that has been published for a long time. It is also, lest anyone be put off by any implications of an over-academic tone in the foregoing, very clearly written. It should form part of the reading of any serious student of Tolkien.